There is such rich symbolism in the myth of Parsifal. It beckons to enquire further into the subject. You will remember, Parsifal is a story of a “fool’s journey” – and it takes someone with the innocence of a humble and simple being, a divine child if you will, to master all the perils on the path, to follow counsel of the wise and not fall prey to their own illusions. It is the innocence, the simplicity that allows to approach the holiest of the sacred – the holy grail, the symbol of the divine, our interior life, that if we drink from it will bring redemption. And it is the encounter with innocence that heals the wounded fisher king, the symbol of the wound every one of us receives growing up, and can never forget. The suffering stays with us until redemption, or enlightenment. So it appears that the wounded part in us needs to find something in ourselves that is about the same age and the same mentality as we were when wounded. This explains to why we keep searching and repeating the same situation over and over again. But in order to heal, we must allow something entirely different to enter, because it cannot be the old mentality. This is why we need to find the “young fool part” in us to be healed. Writing this, it appears to me that this pertains in particular to men, as they need to overcome the fear of the intimacy with the inner feminine, the inherent resistance to return back to what has been wounded. And it’s not that this is not true for women too, but really, the symbolism of the grail is about male psychology. So this is what happens. A wound at a young age, the first encounter with consciousness and this wound cannot be healed without changing the approach – to let down the guard and allow to be touched again on the inside. So Parsifal is the “innocent fool”, the one who has not been wounded, does not even have a name, and approaches everything in a sense of openness, wonder and awe. The divine child, that we all have to find again. 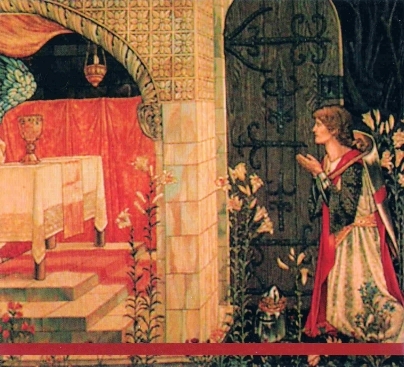 But even Parsifal fails at the first encounter with the Grail. His mentor had instructed him about the question to ask “Whom does the grail serve”, but he is shy and he remembers the words of his mother, who told him “Not to ask questions of strangers”. And this is why he loses the grail the first time. It’s his mothers “homespun garment” that he is wearing, as a symbolism to the attachment of our upbringing. Awakening has this energetic component to it, which I understand best. And from this perspective I read what i have said before. It appears that a woman experiences the “Grail”- the interior, feminine half of God, mother nature or simply that what sustains us, nourishes us, is always reliable and never leaves us, maybe quite different from a man, in terms of keeping that connectedness, even without knowing it. This is again reading the symbolism of the myth, telling of the knights who have to go out and succeed on the outside. Create out of their restlessness. It points back to the yin and yang energies in all of us, but the nature of Being, the great Mother, is feminine – inside, hidden, mysterious, dark. So looking at the human development, as it occurs through the energy system of the body, we have to look at the importance of the first three chakras, which are connected to earth. Even tough each chakra has a male and a female energy to it, the first and the third chakra are masculine, in their dynamic movement. The first chakra grounds us to this earth and establishes our values, tribal loyalty and the root of our identity, It is the chakra of survival and it is here, we receive our original sin of separation. The third chakra is about personal identity, self-reliance and confidence, and again it is masculine. The second chakra, which contains the energy of relating to each other and the energy of creation, is inherently female. So this is where we start when we look at the path of transformation. The first step is the change of vibration in the lower chakra systems, by removing emotional blockages and “losing that homespun garment”, that keeps us tied to the lower realms of our energy system. Transcendence can only happen, if the energy moves up from the lower three chakras, into the energetic realm of the upper chakras. This is the opening of the heart, the experience of Love and Oneness for everyone. It is the inner marriage or the union with the divine. Many concepts, symbols or names have been found to describe what cannot be described – but with the help of a myth and the physiology of the energy system I think we can delineate a path, that marks an attempt of an understanding of the steps of initiation and purification we have to do, before we are ready to look at the holy Grail. We are apparently in an age where consciousness is advancing from a trinitarian to a quaternarian view. This is one possibility and profound way of appraising the extreme chaos our world is in now. It suggests that we are going through an evolution of consciousness from a male (energy) dominated period toward a much broader view, that contains the feminine as well as other elements, that are incomprehensible if one insists on the old values. This entry was posted in Energy Medicine, The Window Seat and tagged Chakra, Divine feminine, Holy Grail, Parsifal, Transformation, Yin and yang. Bookmark the permalink.